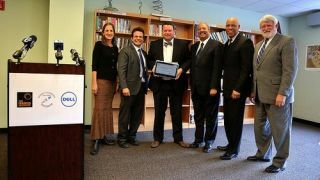 This week, the Science Leadership Academy (SLA) and The Franklin Institute in Philadelphia announced a partnership with Dell that will make the school the first in the nation to deploy the Dell Chromebook 11 as part of its new “Center of Excellence in Learning.” This Center will go beyond a 1:1 Chromebook deployment. Thanks to more than $620,000 in grant money and education technology from Dell, the Center will also enable SLA to share their well-known model of inquiry-based learning with schools around the country through real-time and online professional development opportunities. Tech & Learning Managing Editor Christine Weiser had the opportunity to speak with SLA Principal Chris Lehmann, Google’s Global Education Evangelist Jaime Casap, and Dell’s Director of Worldwide Education Jon Phillips about this announcement. TL: What does this announcement mean for SLA and for other schools around the country? Chris Lehmann: The Center for Excellence at Science Leadership Academy is going to involve a number of different things--not the least of which is that we are moving our 1:1 program to the Dell Chromebook. We're really excited about that. We’ve been a big fan of Google apps for education for a long time. And, as a platform for education, we're really excited to use the Chromebooks. What differentiates this grant is that it not just brings technology to our school, but allows us to create the Center of Excellence. This funding will allow us to invite educators from all over the world to come see what we do, because one of things that differentiates SLA is that it’s not about the technology. The technology is used in service of our inquiry-driven, project-based curriculum. This is a very specific kind of teaching and learning, and our hope is that this partnership will allow us to reach more educators and bring what we do at SLA to other districts. TL: Can you explain briefly how that will play out? Will you bring school representatives here, visit other schools, or have some sort of blended model? CL: The biggest thing is that the funding will allow us to host more visitors. In past years, not counting Educon, we'd host about 100 different organizations a year. We expect that number to grow. To borrow a metaphor from a different field, SLA will become a sort of teaching hospital. What we do here will be transparent. We will also use some of the grant to give SLA teachers time to take their curriculum out into other schools and demonstrate how they teach. Let’s say a school district comes to SLA, sees what we do, and really wants to do it on the ground where they are. We now have funding to send one of our teachers out and spend a day or two at another school district and really teach them how to model our approach in their environment. TL: Thank, Chris. Jon, could you tell us, from Dell’s perspective, a little bit about what led to the announcement today? Jon Phillips: Over the past couple of years, Dell has tried to be more than just a vendor in education, but really a partner in working with our schools and our other partners in education--to really focus on what the heart of the matter is, which we believe is building career- and college-ready students. This means focusing on the learning and using technology as a means to that end. Through various grassroots efforts that we've done with our Think Tanks over the years, we learned about the work of Science Leadership Academy. We saw that Chris's team really focuses on the learning. They have a model that we think can actually be deployed, regardless of the teacher's background and where they're coming from, as long as they have a passion to really engage the student in the learning process. We think this model is very scalable and sustainable and it can be done regardless of whether you’re in a rural or an urban school district, regardless of whether you're a state that is Common Core State Standards or you're a state that has its own standards. So, it was a natural fit to ask SLA how Dell can help Science Leadership Academy both grow internally and continue to innovate. We asked them how we could help them get their platform and their voice out to a national, potentially global audience, and invite students into the learning process through inquiry-based and project-based learning. The result of that conversation is the new Center of Excellence. TL: Thanks, Jon. We also have Jaime Casap from Google here. Jaime, what do you think makes Chromebooks a fit for schools? Jaime Casap: First, let me say that I’m excited about this announcement. Chris snd his team understand that educators no longer have to use technology as the thing that they focus on. Now they can focus on the learning. There are two benefits of Chromebooks for schools. You have the user benefits: they're easy to use, they boot up quickly, and they have long battery lives. If you know how to use a browser, you know how to use a Chromebook. But the real benefit is on the back end: managing and scaling. You can easily configure any Chromebook to any user. I can take Chris's Dell Chromebook right now, log in to it, and access my stuff. It becomes my Chromebook just by logging onto it. The administrators can actually put the apps that they want on each user profile, they can put the Web pages that they want, they have complete control. Kids can take these machines home and they're still logged into your network. They're still logged into your proxy servers and your proxy settings. You can do learning in a completely different way. Chromebooks give you the opportunity to get the technology out of the way. With the Center of Excellence grant, other schools can now come visit SLA and see what that looks like. What Chris is doing here is not about the technology. It’s about learning. You can join the conversation by following #DoMoreEdu. Watch the Livestream Think Tank discussion HERE. And see more photos of the event on Dell's Flickr page HERE.